Pierre HENRY: Antagonismes IV (1996). Philips 468525-2. 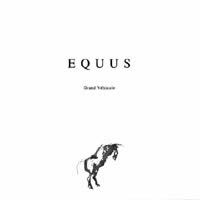 Olivier CAPPAROS and Lionel MARCHETTI: Equus (Grand Véhicule) (2002). Pogus P21052-2 (http://www.pogus.com/). Antagonismes IV hides in Mix 03, the third brick of Universal’s Pierre Henry collection. Fifteen movements span 1:03:35 of pure poetry. Movement titles (“Agonie paisible,” “Respiration des chauve-souris,” etc.) are deliciously obscure and the overall intention is elusive. Facile juxtapositions (gasping, flamenco guitar warmups, birds, dance-band loops, thunder, toy piano, etc.) may haunt or pacify. You won’t want to leave this enveloping world created by Henry and assistant Bernadette Mangin. Persistent hunting on these shores should net all four of the Mix boxes. Equus has everything I admire in classic ea: blended bits of noise, machines and a wee amount of discernible speech culled from disparate sources. A few recognizable lines come from Hitchcock’s Rear Window. However, Equus isn’t a trivia game. Darned if I know what Capparos and Marchetti are after in these three movements. And what does it mean that together they last 33:33? Equus is simply entrancing and wonderful. 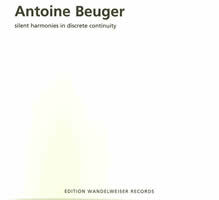 Antoine BEUGER: silent harmonies in discrete continuity (fifth music for marcia hafif) series one (2002). Edition Wandelweiser Records EWR 0402 (http://www.timescraper.de/). 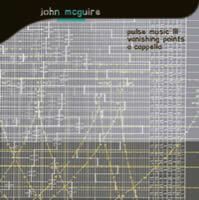 John McGUIRE: Pulse Music III (1978); Vanishing Points (1988); A Cappella* (1996-97). Beth Griffith* (sop). Sargasso SCD 28043 (http://www.sargasso.com/). Beuger’s purely electronic piece consists of 24 three-minute tracks. Each track holds eight pitches spanning several octaves, resulting in what I can best describe as mentholated chords. Because the piece is dedicated to Marcia Hafif, a painter known for predominantly solid-colored canvasses, it was easy to imagine this work as a stroll through 24 exhibits, one for each eight-note chord. Inspired by Hafif’s work, Beuger has fashioned a diverse series of pieces over the years. Each chord fades in and out within the three-minute track, so that the imposed silence is a considerable part of the experience. Fizzy and bubbling, McGuire’s candy-striped electronic works, Pulse Music III and Vanishing Points, may initially taste of minimalism. However, the variably speeding arpeggios, unpredictable rhythmic and harmonic shifts suggest larger mathematical preoccupations, which the program notes confirm. A Cappella tightly melds a live soprano against recorded computer-manipulated instances of herself. The vocalist and tape concentrate upon three-vowel sounds which are tumbled at different speeds and tessituras. Little bits do stick in the brain. All three works were commissioned by West German Radio, Cologne and produced at their electronic music studio. 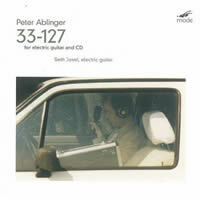 Peter ABLINGER: 33-127 (2002). Seth Josel (elec. guit.). mode 206 (http://www.moderecords.com/). “Orpheus400.” Comps. by Hans W. Koch, Kazuya Ishigami, Harald Muenz, Jens Brand, Raoul Haarmann, Thomas Kessler, Wolfgang Liebhart, Johannes Kreidler, Frank Niehusmann, Gerald Eckert, Johannes S. Sistermanns, Andreas Wagner, Thomas Gerwin, Joachim Heintz, NooK (Dirk Specht and Gerriet K. Sharma), Heinz-Josef Florian, Clemens von Reusner, Franz Martin Olbrisch, Dugal McKinnon and Andre Bartetzki. Cybele Records 960.209 (1 CD) (http://www.cybele.de/). Distributed in the US by Qualiton (http://www.qualiton.com/). CD9 in Cybele’s DEGEM series. I’ve hammered away at Ablinger before. Against expectations, this mode release featuring electric guitar and tape hits the spot. Perhaps it’s the unintentional comedy of 95 tracks following the same pattern: The solo guitar essays a moderate descending scale, is briefly interrupted by dense street noise which it tries to accompany with frantic gestures, thence returning to quiet descent. A bipolar guitarist would be best suited to execute these caroms. It’s not necessary to ask what 1-32 may be like — presumably the epic’s front end bears resemblance to the concluding 76%. The work did make me think of Orpheus in Hades intent on retrieving Eurydice. Speaking of whom: Curated by Stefan Fricke, Orpheus400 offers 20 varied ea compositions commemorating the 400th birthday of Monteverdi’s L’Orfeo. Some pieces tackle the Orpheus myth, others go after the opera. One stipulation is that no piece exceeds 400 seconds. The contributions range from 0:04 to the full 6:40. Different pieces will hit or miss, depending upon the listener’s mood. A random selection: Koch’s orfeus@home, suggesting a musician’s morning routine, is hard not to like. Other pieces like Kreidler’s Kontinuum mit Melodie and Gerwin’s Orpheus 400 > e-scape No: 4 pull in distorted Monteverdi bits. I’m thinking NooK’s Orphée 49/Edit 1 (Hommage à J.C.) incorporates Cocteau references. Not just because the title implies the other side of the Orpheus story, Florian’s Eurydikes Schrei provides an agitated dream state. 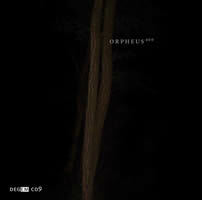 The four-second track, Olbrisch’s Orphée 2007, succeeds in telling a story in less than a full breath. 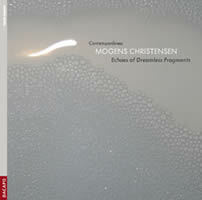 “Echoes of Dreamless Fragments.” Mogens CHRISTENSEN: Nimbus of Queen Hatasu1 (2000/02); Dreamless Fragments2 (1994); Fragments and Echoes of East Earth DrEaming3 (2005-06); Echoes of Fragments4 (2005-06); East Earth DrEaming5 (2005-06); Aksara6 (2006). Contemporánea: Fritz Gerhard Berthelsen1, 3, 5, 6 (bs clar), Henrik Larsen1, 6 (perc), Alina Komissarova2, Øssur Bæk6 (vlns), Irina Kalina Goudeva4 (cbs), Ejnar Kanding (electronics), Alfredo Oyaquez (cond.). Dacapo 8.226521 (http://www.dacapo-records.dk/). Distributed in the US by Naxos (http://www.naxos.com/). 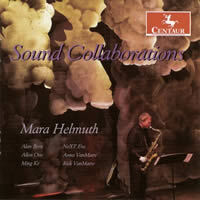 “CDCM Computer Music Series Volume 36.” Mara HELMUTH: No. 71 (2004); Abandoned Lake in Maine (1997); The Man and the Moon2 (2004-06); Smoke3 (2004-06); The Edge of Noise4 (2004); Mountain Wind5 (2003). Allen Otte1 (perc), Alan Bern2 (accordion), Rick VanMatre3 (ten sax, alt sax), NeXT Ens4, Ming Ke5 (pipa), I-Yin Tu5 (fl), Carlos Velez5 (alt flute), James Massol5 (bsn), Timothy O’Neill5 (vln), Kaylie Duncan5 (vc). Centaur CRC 2093 (http://www.centaurrecords.com/). Distributed in the US by Qualiton (http://www.qualiton.com/). Electronics perform a modest rôle in Christensen’s six related pieces for solo or small ensemble and computer, most written in collaboration with Contemporánea, an electroacoustic ensemble from Copenhagen. Sometimes recorded tape parts lend atmosphere, but mostly the electronics offer gentle distortion or looping of instrumental fragments of what the players perform. The standouts are the two related works for solo strings and computer, Dreamless Fragments (violin) and Echoes of Fragments (contrabass), wherein baroque filigree conjoin with rasping and growling. The two bass-clarinet and computer pieces, East Earth DrEaming and Fragments and Echoes of East Earth DrEaming, embed similar pre-recorded elements and solo gestures. (No idea why “DrEaming” is spelled this way.) Nimbus of Queen Hatasu is a trio for bass clarinet, percussion and computer, and the especially vivid Aksara adds violin and contrabass. It would be a mistake to overlook Helmuth’s understated electronic efforts across these six works. In the aptly titled seventh collaboration with percussionist Otte, No. 7, who here plays African gyil and tuned logs, the computer manipulates and repeats the xylophone-like sounds. In The Man and the Moon a seemingly straightforward accordion tune (a Swedish hambo) drifts elsewhere. Most of these pieces offer modest surprises. 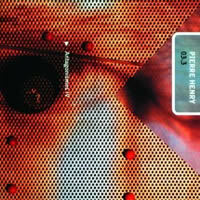 The frolicsome The Edge of Noise matches ensemble with computer and includes a spoken part. The atmospheric Mountain Wind employs a smaller group plus Chinese pipa. Smoke, which incorporates Anna VanMatre’s graphic installation with saxophones and computer, is perhaps the least satisfying, mostly due to the wind instruments’ all-too-predictable contributions. Abandoned Lake in Maine is a pure electroacoustic piece blending natural sounds with a heavily manipulated naturalist’s voice. The title bears reflection: How can a lake become abandoned? 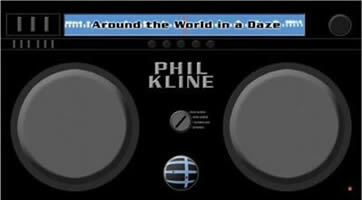 Phil KLINE: Around the World in a Daze (2007). Starkland S-2015 (2 DVDs) (http://www.starkland.com/). Starkland commissioned this 10-movement album to be the DVD medium’s first surround-sound composition. As a child of yesteryear’s stereophony, I arrive a day late and a dollar short, to wit, without the proper playback equipment. (The disc plays in stereo and high-res surround.) It would seem that the work has something to do with places and moods, and yet the evocative titles and whimsical subtitles connect rather tenuously to locales or to each other. I don’t hear On the Waterfront — “This is not a recording, but something happening right now in Istanbul” — as particularly Turkish. Its layered water noises and a woman in ecstasy could happen anywhere. Conceptual qualms aside, the program offers several nice pieces. Luv U 2 Death cleverly skips through Wagner. Prelude (the ninth track, not the first) overlays a distorted Bach keyboard prelude (B-flat minor from WTC I) with a Zurich train station’s ambient noises. The longest and most striking piece, Pennies from Heaven, is an 18:16 cascade of descending plinks in the manner of a never-ending Nancarrow etude. The central eight movements are bracketed with two similarly titled pieces, The Housatonic at Henry Street (also on Immersion, Starkland S-2010) and The Housatonic at Dzanga, which breathe the sprit of Ives from NYC to Africa. The first DVD contains the title work proper. The second offers the music-plus-video Meditation, which could as easily have been titled Anxiety thanks to a fast-moving city tour, a John Schaefer interview, and a scattering of production photos. As to packaging, when opened, the two disc trays simulate a boombox, one of Kline’s preferred technologies. Should you play Around the World as a DVD video, you’ll have a chance to enjoy Kline’s excellent photos.